Back to another of our favourite regular venues, Bix Manor. 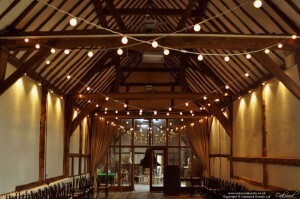 This time we installed this lovely simple canopy of festoon lights in the main barn area. The festoons form a series of crosses between the beams and are fully dimmable for the evening. See our Bix Manor Lighting page for more ideas, or feel free to contact us to discuss lighting for your wedding or event at Bix Manor.